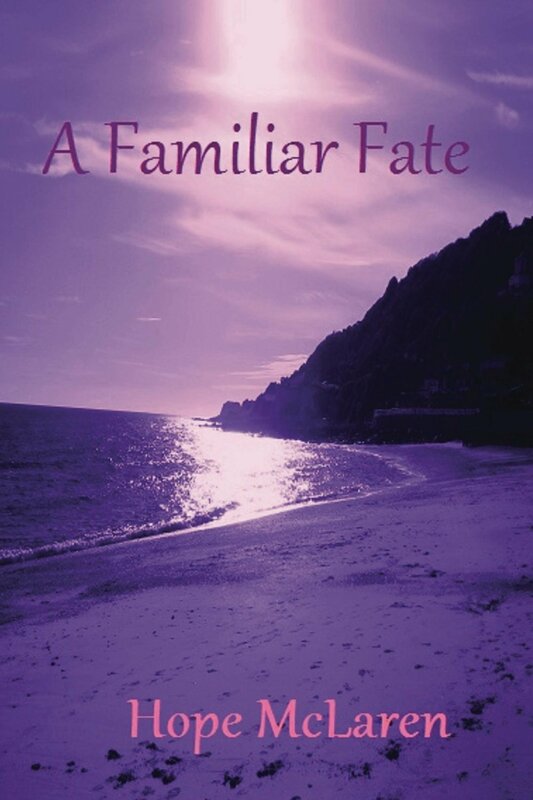 If you’re a fan of paranormal fiction, you will find Hope McLaren’s debut novel, A Familiar Fate, very engaging. “A full moon cast its glow over the roofs of darkened houses, their occupants fast asleep inside. I was the only living soul in the area…” starts this tale of witches and other supernatural creatures. These first lines draw you into the book and don’t let you go until the last page. Violet Evans, a sixteen-year-old orphan, has no easy life. Nine years ago, she lost her parents and was placed in foster care far away from her home. You would expect an outpouring of compassion and care for such a young girl who, through no fault of her own, is left all alone in the world. Instead, all these years she has been treated as a slave in her new “home” by her foster mother and as an outcast at her new school. Her pariah status at school is basically the result of her “mother’s” tyranny, which has killed her self-esteem. Thus, all Violet has in life are her weird dreams, the source and recurrence of which she struggles to understand, and questions about her true identity and the tragic demise of her parents. When encountered with strange phenomena, this impressionable girl has a hard time distinguishing between reality and her fantasy. But she soldiers on in her search for the truth. Lots of exciting and scary things happen during her journey, which is what has kept my eyes glued to the pages of the book. I personally am not into supernatural tales, but I enjoyed this beautifully written coming-of-age story of Violet Evans and I’m glad that it’s the first one in a series and there’ll be more to come. Awhile ago, I posted my opinion on Gillian Flynn’s bestselling thriller, Gone Girl, calling it brilliant and shocking. By “shocking” I meant the ending. Now, I while listening to the interview with this terrific author, I learned that she hadn’t planned this ending in advance for the simple reason that she hadn’t known it until she reached the end. First, not only does Gillian Flynn like to shock her readers by the ending, but she likes to surprise herself as well. That’s surely something to look forward to during the writing process. Second, although Flynn states in this interview that we don’t/can’t know another person completely (which is exactly what the readers infer), she seems to know her characters pretty well. So well, in fact, that she “listens” to them and writes down what they “tell” her to write. In other words, she trusts them. Which is brilliant! I love reading series and sequels. 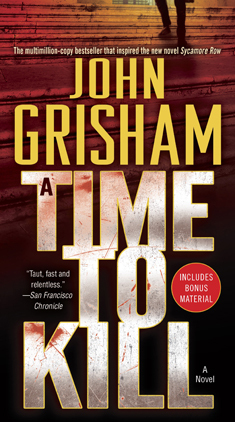 So when I learned about John Grisham’s sequel to his first legal thriller, A Time to Kill, coming out soon, I realized that I hadn’t read it yet. So now I have. A ten-year-old girl is gang-raped and almost killed by two redneck scumbags. She has to live with the nightmare her whole life, and her family also has to deal with the tragedy. The people in this little town ask themselves and others the burning question: Should you trust the judicial system to deal with the perpetrators, or should you take justice into your own hands? The paperback of A Time to Kill is 655 pages long, but every single page is not only worth reading but is enjoyable too. That’s how engaging and good his prose is. The novel has everything you want in a thriller: well-drawn characters, high stakes, multi-layered plot, nail-biting suspense, and conflict upon conflict upon conflict. Oh, it’s laced with humor too, despite the serious subject. And humor is exactly what we readers need, sometimes, to get through serious, heart-rending events described in a novel. Grisham, a lawyer himself, demonstrates his intimate knowledge of legal matters and court procedures, as well as his great understanding of racial issues in the South. The novel would be a great choice for discussions with friends, family, or in a book club. I loved the main characters in A Time to Kill and I can’t wait to get my hands on the sequel, Sycamore Row, which is coming out in October. This week was pretty good. I kept moving forward, revising the existing chapters and even adding a new one. It fits perfectly as a logical outcome of the scene in Ch. 15, and it was quite a shock to me that I hadn’t thought of it before, while writing my first draft. Books have the quality of “lasting creation.” When you, the author, are long gone, the books you created will still be out there. Well, how can anyone disagree with it? Great books become classics. Writing is damn hard, so to do that you have to have a passion. Your heart and soul have to be in the book you’re writing, otherwise the text will be flat, as opposed to electric. If the book has the energy, it engages you as the reader. You enter the thought stream of the characters and you’re with them. Absolutely! Well, enjoy the interview. It’s great! Louise Erdrich’s coming-of-age novel, The Round House, is narrated by Joe Coutts, a Native American, who recollects the tragic events that happened in his life in the summer of 1988, when he was thirteen. Although he’s a college educated adult, a lawyer no less, he uses the voice of a 13-year-old boy, which points to Erdrich’s brilliance as an author. Joe’s mother is viciously attacked. His father, a tribal judge, cannot bring justice to his family not because he’s incompetent, but because the US laws do not always protect Native Americans. HIs family, previously loving, caring, and happy, is on the verge of falling apart. Joe is suddenly facing adulthood, his adolescent years, so important for his psychological growth, are in jeopardy. The Round House is a novel of injustice and retribution, of crime and punishment, of family love, of suffering and redemption. It is filled with rich folk tales and humor. The exploits of Joe and his buddies, trying to play detectives, keep you in stitches. It was an eye-opener to me that this indigenous people, whose land was taken by violence centuries ago, has no equal rights with the majority population—to this day. Louise Erdrich’s love and respect for her heritage is obvious throughout the entire book. For the first four days, I had been doing pretty well with my revisions, making two steps forward, one step back, adding, deleting, adding some more, but steadily improving my manuscript. Then came Friday, and I fell off the wagon. I had to spend the entire day at a car dealership. Although the result was satisfying, this draining experience took the creative wind out of me. I didn’t accomplish much afterwards. But my relapse is temporary. I know I’ll pick up tomorrow and get back on track. And I know that I’ll finish this draft by the end of this month. I still have thirteen days. It’s not much, but sometimes I work better under time pressure.